PyQt is a GUI widgets toolkit. 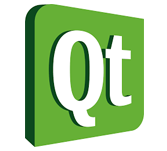 it is a Python interface for Qt, one of the most effective, and popular cross-platform GUI library. PyQt is a mix of Python programming language and the Qt library. This introductory tutorial will help you in developing graphical packages with the assist of PyQt. This tutorial is designed for software programmers who are keen on studying the way to develop graphical applications the use of PyQt. You need to have a basic information of computer programming terminologies. A fundamental knowledge of Python and any of the programming languages is a plus.